Speaking of sparklers, the Fourth of July is coming up, tho naturally I prefer to think of it as the 30th anniversary of the Bicentennial. 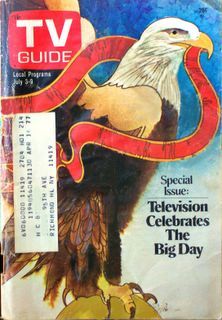 In commemoration of this, over the next few days I will be presenting--what else--pictures from old TV Guides and newspapers! 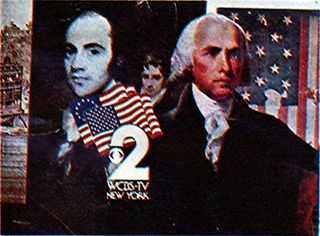 For NYC area folks, here's a station break identification card from WCBS that you might have seen during, say, Dinah! or Mike Douglas. 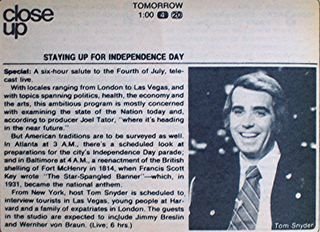 A live six-hour salute to Independence Day hosted by Tom Snyder? Only Tom Snyder could stand that much Tom Snyder. Remember these dopey TV tests? They had them about smoking and safety and stuff like that too, usually hosted by Frank Field. 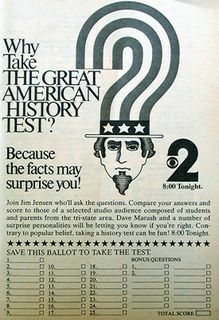 You'd get all set for the program with a pencil and your scorecard at the ready, then after about three questions, wearily switch over to check in on Adam-12 or to see who was on Match Game PM. Church and State, together at last! I wonder if you can find one of these car decals on eBay. 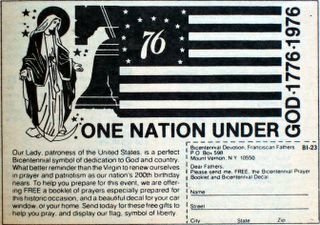 It sure would make a swell Bicentennial gift, hint hint... Mary has either been hitting the sauce or struck on the noggin, judging from the comical stars and bubbles around her halo. 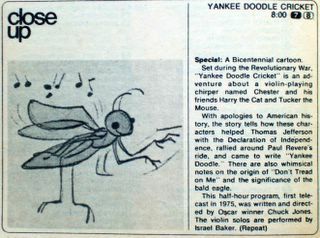 Freedom Is, a cartoon special you're sure to not remember. Another production from the Lutheran Layman's League, the cruel folks who brought you the tedious Christmas Is and the cheerless The City That Forgot About Christmas. The all-star vocal talents of these "specials" do nothing to offset the near-static animation and treacly, uninspired preachiness. The Christmas shows actually still turn up on local TV here. They must be in the public domain, though I don't know why a station wouldn't opt to show an infomercial instead. That line being from "Saints" by The Breeders, a favorite tune for cruising with the top down (or, at least, the windows down, never having owned a convertible). The ultimate summer song, however, jingled unceasingly from atop a white truck depicting a sweet, swirly-headed fella known as Mister Softee. Now that brings back memories! Goddammit, I want me some Softee! Alas, I'd have to go to Las Vegas to find the nearest truck (which makes it the first and only entry on my list, "Reasons for Going to Las Vegas"). Actually, I think Circus-Man might have been my favorite, because they also sold neat crap like water pistols, sparklers, Wacky Packages and those black pellets you'd light on fire so they'd grow into snake-like ashes which stunk of burning rubber. (Exactly why that once struck me as so much fun kind of eludes me at the moment, and yet I can't deny wishing I had a packet of them right now.) Also, Circus-Man had those gingerbread and vanilla ice cream sandwiches, which were so good I once wrote a bad poem mentioning them, published in Report To Hell #3. The poem is every bit as lousy as it was in 1993, but now I can publish it in the color of gingerbread! Technology makes everything better! The Circus-Man push-up pops, another favorite, had plastic circus figures on the stick which were hidden in the sherbet until you ate it away. Like the snake pellets, these were also fun for no discernible reason. I'm sure I had a useless, sticky collection of them stashed away somewhere (somewhat similar to the stack of Playboys I procured during my teens, except those were frequently used, much stickier and stashed with the utmost care).